Season 8 of Larry David's hilarious, irreverent, and politically incorrect sitcom, Curb Your Enthusiasm, returns tonight at 10 pm EDT on HBO with one of the funniest and Jewiest episodes in the series. Thursday night we saw a preview of this first episode together with 1,500 ticketholders and members of the press in the main auditorium of 92nd Street Y in Manhattan. It was followed by a 90 minute panel discussion featuring David and leading members of the show's cast, moderated by NBC news anchor Brian Williams. Williams, bringing down the house with his opening comments, "Welcome to 'Let's find a Catholic to moderate. 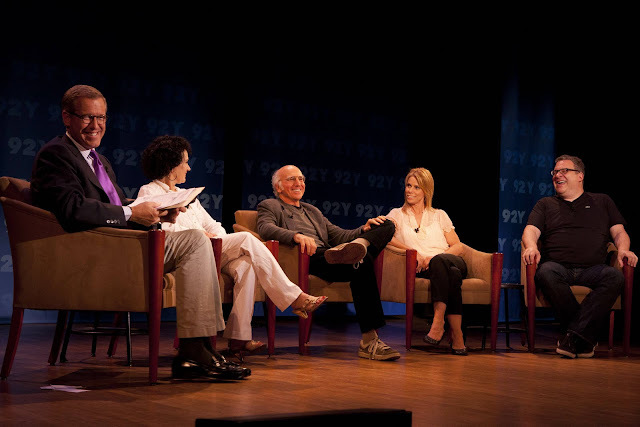 I'm the house goy,'" asked Larry David, Jeff Garlin, Susie Essman, and Cheryl Hines questions about how the show originated, what goes on behind the scenes, and how Jewish the Jewish cast members are in real life. The cast also fielded questions from the 92Y audience and from viewers who were participating through 92Y's satellite hookup with Jewish Community Centers across the country. Williams asked David if he is frustrated that some people just don't get his comedy, to which he replied, "If everybody gets it, something is wrong. The object of comedy is to offend." And this episode, like most others, tries its best to offend everybody. Garlin said the doesn't get blowback from Jews, adding "The orthodox are known for their great sense of humor." Essman characterized the series as providing "equal opportunity insults." "On the subject of personal Jewish observance, Garlin started with "I wear tefilin every day," which got a big round of laughter. But he added, "I'm not religious, but I do Rosh Hashanah, Passover. I really love Purim. I love being a Jew. Let's leave it at that." Asked to name his greatest comedic influences. David replied that Woody Allen and Mel Brooks influenced him the most, and that Don Rickles is "the funniest guy in the world." It's one thing to laugh at a funny sitcom in your own living room, but it's quite another when you're watching with 1,500 fans in a theater, laughing so hard that it drowns out some of the punch lines. We promised not to reveal details and punchlines from the episode that would make us spoilers. So all we'll say is that this one is not to be missed, unless you have a strong aversion to unprintable language, ethnic insults, and rolling on the floor laughing. Here's the promotional trailer from HBO. Enjoy!